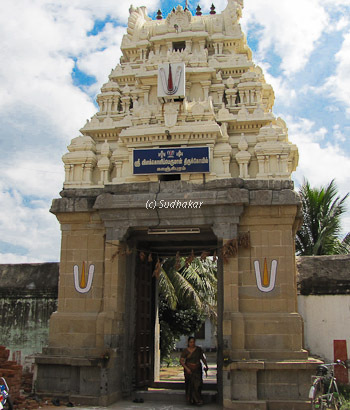 Thiru Thanka or Thoopul is one of the 108 divya desam temples situated in Kanchipuram. The perumal in this sthalam is called 'Deepa prakasar'( Deepam- light) or 'Vilakoli perumal' (Vilakoli - light). The legend behind the place Thiru Thanka goes like this. Lord Brahma wanted to perform Aswamedha Yaagam in Kanchipuram. Asuras wanted to stop that yaagam. The Asuras stopped the light by covering the sky and spread the darkness. To save the world and the yagam Sriman Narayanan appeared there as a "Light" and cleared the darkness. Since the Lord Narayana appeared like a bright light, the Perumal here is called as "Deepaprakasar". Deepam means light and Prakasam is brightness. Since the Perumal shone like light, He is also called as "Vilakku Oli Perumal". The Moolavar here is Sri Deepa Prakasar or Vilakoli Perumal in a standing position facing West. Thayar of this sthalam is Maragathavalli thayar. Other Sannidhis: There is a sannadhi for Vedantha Desikar (this is his birth place), where he is found with Gnana Muthirai and a sannadhi for Lakshimi Hayagreevar is also found. Temple location It is situated in Kanchipuram very near to Ashtapujanga temple. Other interesting places around Kanchipuram It is a temple town with 15 out of the 108 divya desams spread around here.